Summary: Discusses how to bypass a proxy server to access a local Zoo server. Today, many organizations use proxies to protect their users from intrusion and to use smaller amounts of publicly routed IP addresses. A proxy is a server that sits between you and the Internet. It receives all client requests to the Internet, fulfills the request itself, and then sends the information to the client. There are instances where you prefer to bypass the proxy and access the website or resource directly. A example is the locally available resource, like a Zoo Server, which is available through a direct network access. Windows offers support for adding and configuring proxies inside Internet Explorer’s settings. Click Network and Internet, and then click Internet Options. In the Internet Options dialog box, click the Connections tab. 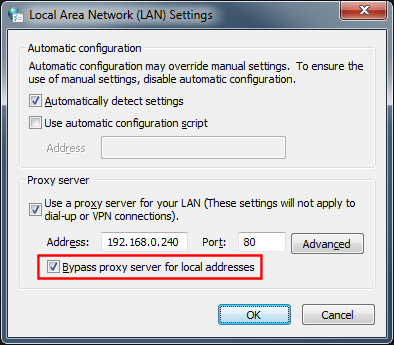 Select the Bypass proxy server for local addresses checkbox. Click OK to complete the proxy configuration process.